I am getting really annoyed with snow days, here in this land we live, where barely any snow can make it into a “snow day” for my children’s schools. This time, however, we really got snow. Like a lot of snow, even compared to the days we used to live in Utah. We drove home from a church activity (that got canceled by a Bishopric member due to the fast falling snow) and I was scared. Like literally worried that we wouldn’t make it home safely. We did, and I’m glad my husband was driving. I hate driving in the snow. Bad weather already canceled our church this past Sunday. Basically, I’m like, what happened? I thought we moved to this place partly because the weather wasn’t supposed to be extreme (aka little to no snow)? Ah well, at least it’s pretty. 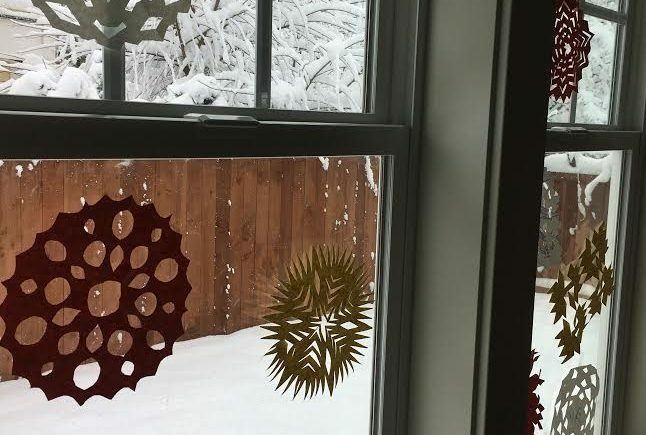 I was looking outside our front window with my four old daughter (who was basically singing the beginning of the “Do you want to build a snowman?” song from “Frozen” on repeat) at a dog frolicking in the snow on the sidewalk right outside our house. I thought it was so cute and wonderful, seeing this dog practically swimming in the snow, until he stopped, crouched, and defecated on the pristine snow right outside my front window. Animals, man. No respect. I banged on the window and the dog ran off, but still his present remained, waiting for new snow to cover it up or for some unsuspecting child to plow right into it with his sled in hand. It better not be my kids is all I can say. We don’t have sleds, so that’s good. Other than that, I am carrying on. I had some obsessive thoughts about honesty in regards to a the book I just submitted to two publishers, and I mourned the reality of having OCD about an OCD book. But that’s my life. It’s like whenever something becomes important to me, the OCD knows to focus on that thing and attempt to destroy any peace of mind I had or have about it. That’s its way. I’m hearing the obsessions more loudly these days, listening to them tell me all the horror stories of things that could happen if I don’t engage in compulsions. They still are focused on contamination issues mostly (besides this honesty one that cropped up). I’ve also started recording my daily weight again as I attempt to get healthier, so I have to be careful to not let the OCD latch on to my exercise and eating habits. I used to have great anxiety about needing to exercise at least 50 minutes a day and would go into a deep funk if I didn’t lose weight or maintain weight from day to day. If I went up, I was really put out. I need to try not to fall back into those habits again. Being aware of and remembering past concerns is helpful, I think. When we forget about them, we become more easily tricked into reengaging in things we’ve already overcome. It’s not always easy, though, because we also remember why we worried about them and sometimes those “reasons” or obsessions still make sense in some part of our mind. It’s all about vigilance, really. Vigilance and keeping on moving, hopefully forward. How is your winter? Any huge snow storms? Has your week been successful, OCD-wise?